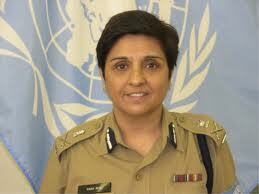 Biography of Kiran Bedi: The first women police officer, Kiran Bedi, About Kiran bedi, Who is Kiran Bedi. Kiran Bedi was the first woman police officer of India. She was born in 1949 in Amritsar. Kiran Bedi began her career as a lecturer and later joined police force. She is the winner of the Magsaysay award in 1994. Kiran Bedi is one of the active members of civil society and a strong supporter of janlokpal bill. She is the host of a programme named ‘apki kachehri’ that is meant to solve the legal issues of the citizens. Kiran Bedi was the first women police officer of India. She is a strong supporter of the Janlokpal bill and one of the most active members of the civil society. She is a lady having an iron will. She has won many awards for her contribution in providing good governance and an effective leadership. But it is not the only achievement of Kiran Bedi. In this article you will come to know about her personal life, career as a police officer and all the social work done by her. Kiran Bedi was born in Amritsar, Punjab on 9 June, 1949. She has been an Asian Tennis Champion and has won many other tennis championship titles. She did her Bachelor of Arts in English (Hons.). She then earned a Master`s degree in Political Science. Her father was a tennis player. In 1972, Kiran Bedi married Brij Bedi and has a daughter. She began her career as a Lecturer in Political Science (1970–72) at Khalsa College for Women. She joined the Indian Police Service, becoming the first women police officer of India. On 27 November 2007, she voluntarily retired from the police force. She has set up two non-profit organizations. One is Navjyoti and the other one is India Vision Foundation. She is an active member of the civil society and an ardent supporter of Janlokpal bill. She undertook various kinds of measures, during her tenure to improve the conditions of prisoners in the Tihar jail. She is the host of a programme named `aapki kachehri` that is meant to solve the legal issues of the citizens. STAR Parivar Award STAR Plus in 2010. Mother Teresa Memorial National Award by Indian Development Foundation in 2005. United Nations Medal, United Nations in 2004. Woman of the Year Award by Blue Drop in 2002. Father Machismo Humanitarian Award Don Bosco Shrine Office in 1995. Ramon Magsaysay Award in 1994. Women of the Year Award by National Solidarity Weekly in 1981. President`s Gallantry Award by President of India in 1979. I dare! : Kiran Bedi by Parmesh Dangwal. Kiran Bedi, the kindly baton by Meenakshi Saxena.